Our professional guide will add depth to this tour and ensure you have a fulfilling experience of the Battle of the Somme. With him, you will discover Villers-Bretonneux, Beaumont-Hamel, Lochnagar Crater at la Boisselle, Pozières and the Town of Péronne with its famous historial of the Great War. During WWI, most of the fighting took place on French soil and the department of the Somme became a world arena involving more than 20 different nationalities. Even after 100 years, and with no direct participants left alive, the haunting graveyards of northern France still have a remarkable power to evoke memories of events and human loss on an almost unimaginable scale. On this complete, full‐day tour, you will discover the main WWI areas, from small sites in the midst of rolling fields to the major cemeteries holding thousands of victims. With your licensed guide, you will re-live the principal events of the battle of the Somme where 3 million soldiers would fight over a front of only 45 kilometres. Your licensed English-speaking guide will pick you up from your hotel in Paris at 7.00 am in a deluxe private vehicle and you will depart immediately to the wonderful region of Picardie, just an hour and a half north of Paris. Upon your arrival, you will be given an introduction by your private guide to the battle of the Somme. This is considered one of the worst battles of WWI because of the horrific losses. 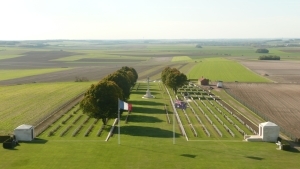 You will begin your day at Villers-Bretonneux with the visit of the Australian Memorial where you will enjoy panoramic views of the Somme countryside. After an emotional walk through the cemetery, you will discover the site of Beaumont-Hamel, situated right on the front line. 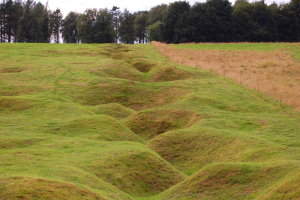 Because of the preserved trenches, the battlefields is easy to imagine here, making your visit a very moving experience. With your guide you will explore this area where a dramatic period of history took place and you will have the opportunity to admire the Newfoundland memorial. 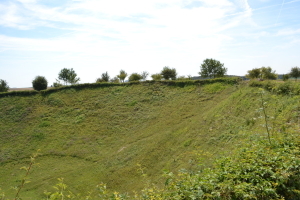 It is now time to see the only crater accessible to the public at La Boisselle : the Lochnagar Crater which is 21 meters deep and 91 meters in diameter. You will then enjoy the scenery whilst driving across the countryside before reaching one of the highlights of the day : Pozières. This village was a key point in the German second line. It was captured by the Australians in August 1916 and was the start line for the first ever attack by tanks (see the Tank Memorial) – the battle was one of the bloodiest in the history of the world. Following this, you will have a lunch (not included) in a traditional restaurant in the town of Péronne (for almost the whole of the war, the town of Péronne was occupied by German troops) Enjoy some of the best specialities of the Picardie region. BON APPETIT ! After this delicious lunch you will discover the Museum of the Great War located near the heart of the world War I Somme battlefields. You will have the opportunity to view remarkable films and documentaries before heading back to Paris in the late afternoon, where you will be dropped off at your hotel around 6.00pm.